Don't judge these handsome vinyl windows only by their striking appearance. You can order vinyl windows to match most every home design scheme and color. But, more importantly, vinyl windows have superior insulation properties than conventional wood windows and they're more resistant to mold, weather damage, and solar heat gain. This attractive set of double-hung, six-panel windows are double glazed to meet conservation requirements without detracting from the natural allure of the original structure. 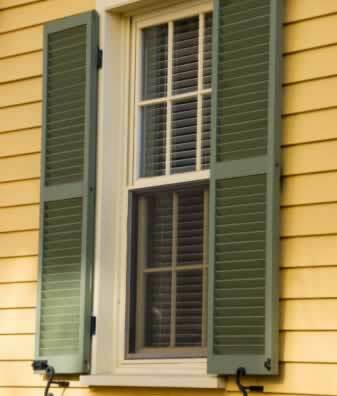 Add vinyl shutters with decorative hardware to complete the historical motif of your home. These durable vinyl windows are easy to maintain with soap and water. They resist rot and condensation, and there's no need to re-paint them year after year. Discover how these charming windows can add lasting value to your home.